Haydock stages the Betfred Grand National Trial this weekend with the first three home in the Welsh National set to renew rivalry. Monbeg Dude just edged out the favourite Teaforthree by half a length in the Chepstow marathon and now meets the runner-up on 3lb worse terms. However, Michael Scudamore’s much improved eight-year-old is one of those horses that only does just enough to get his head in front. He was given a masterful ride by Paul Carberry and cruised into contention in the home straight whilst Tony McCoy was hard at work on Teaforthree. Scudamore resisted the temptation to enter Monbeg Dude for the Grand National this season so will be going all out for this valuable prize. Teaforthree is on course for Aintree and may not relish another stamina sapping effort in heavy ground. In the circumstances, the 6-1 offered about Monbeg Dude makes more appeal than 9-2 Teaforthree. Third home at Chepstow was Triggerman who was sent off a 50-1 chance that day. Jockey Richard Johnson must have been surprised at how well he travelled that day but he was eventually left 11 lengths adrift of the first two. He has a hefty 12lb pull in the weights and there could be worse 20-1 shots if he turns up in the same frame of mind on Saturday. One horse that should not be completely overlooked is last year’s winner Giles Cross. He suffered an interrupted preparation for the Welsh National but travelled and jumped beautifully until his lack of fitness told in the straight. He is a well known mudlark and won this race last year when defeating subsequent Grand National winner Neptune Collonges. He was all the rage for the Aintree marathon when it looked as if he would get his favoured soft ground but a couple of drying days saw his chances disappear. A proven course and distance winner, he is certainly not out of it at 10-1. The ante-post favourite is the Venetia Williams-trained Rigadin De Beauchene at 4-1. He rallied bravely to win the Warwick Classic from Godsmejudge and Pete The Feat. He has been raised 9lb for that effort and it may not have been the classiest renewal of the Warwick feature. In his previous race he was beaten by Well Refreshed at Lingfield and that horse has since romped to a 28-length win at Plumpton in the Sussex National. Rigadin De Beauchene has a 12lb pull in the weights from Lingfield and ought to reverse the placings. Cannington Brook may be the best of the rest having finished second to Carruthers after winning Haydock’s Tommy Whittle Chase in a thrilling battle with Merry King. He races off the same handicap mark that proved too much at Ffos Las but his liking for Haydock will surely count in his favour. In summary, the Welsh National form may hold the key to this event with Monbeg Dude and Teaforthree looking certain to feature. It may pay to side with Monbeg Dude but it would be no surprise to see Giles Cross return to something his best and run a big race on Saturday. 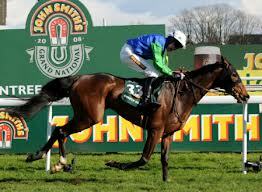 Check out our grand national trial betting article to learn how to wager on this race at Bet365.com.